Despite all the hand-wringing over the vaunted China slowdown, the Chinese economy remains the single largest contributor to world GDP growth. For a global economy limping along at stall speed – and most likely unable to withstand a significant shock without toppling into renewed recession – that contribution is all the more important. A few numbers bear this out. If Chinese GDP growth reaches 6.7% in 2016 – in line with the government’s official target and only slightly above the International Monetary Fund’s latest prediction (6.6%) – China would account for 1.2 percentage points of world GDP growth. With the IMF currently expecting only 3.1% global growth this year, China would contribute nearly 39% of the total. That share dwarfs the contribution of other major economies. For example, while the United States is widely praised for a solid recovery, its GDP is expected to grow by just 2.2% in 2016 – enough to contribute just 0.3 percentage points to overall world GDP growth, or only about one-fourth of the contribution made by China. A sclerotic European economy is expected to add a mere 0.2 percentage points to world growth, and Japan not even 0.1 percentage point. China’s contribution to global growth is, in fact, 50% larger than the combined 0.8-percentage-point contribution likely to be made by all of the so-called advanced economies. Moreover, no developing economy comes close to China’s contribution to global growth. India’s GDP is expected to grow by 7.4% this year, or 0.8 percentage points faster than China. But the Chinese economy accounts for fully 18% of world output (measured on a purchasing-power-parity basis) – more than double India’s 7.6% share. That means India’s contribution to global GDP growth is likely to be just 0.6 percentage points this year – only half the 1.2-percentage-point boost expected from China. More broadly, China is expected to account for fully 73% of total growth of the so-called BRICS grouping of large developing economies. The gains in India (7.4%) and South Africa (0.1%) are offset by ongoing recessions in Russia (-1.2%) and Brazil (-3.3%). Excluding China, BRICS GDP growth is expected to be an anemic 3.2% in 2016. So, no matter how you slice it, China remains the world’s major growth engine. 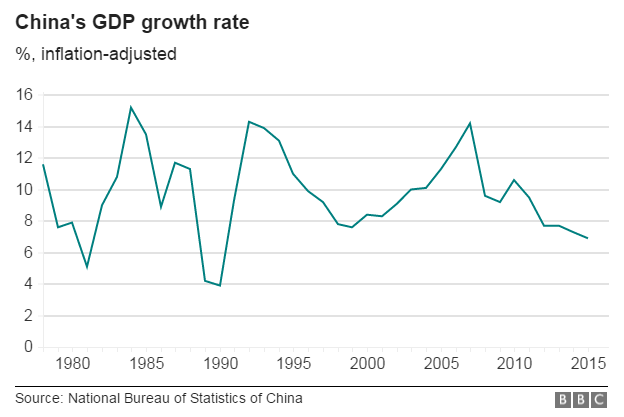 Yes, the Chinese economy has slowed significantly from the 10% average annual growth recorded during the 1980-2011 period. But even after transitioning from the “old normal” to what the Chinese leadership has dubbed the “new normal,” global economic growth remains heavily dependent on China. There are three key implications of a persistent China-centric global growth dynamic. First, and most obvious, continued deceleration of Chinese growth would have a much greater impact on an otherwise weak global economy than would be the case if the world were growing at something closer to its longer-term trend of 3.6%. Excluding China, world GDP growth would be about 1.9% in 2016 – well below the 2.5% threshold commonly associated with global recessions. The second implication, related to the first, is that the widely feared economic “hard landing” for China would have a devastating global impact. Every one-percentage-point decline in Chinese GDP growth knocks close to 0.2 percentage points directly off world GDP; including the spillover effects of foreign trade, the total global growth impact would be around 0.3 percentage points. Defining a Chinese hard landing as a halving of the current 6.7% growth rate, the combined direct and indirect effects of such an outcome would consequently knock about one percentage point off overall global growth. In such a scenario, there is no way the world could avoid another full-blown recession. Finally (and more likely in my view), there are the global impacts of a successful rebalancing of the Chinese economy. The world stands to benefit greatly if the components of China’s GDP continue to shift from manufacturing-led exports and investment to services and household consumption. Under those circumstances, Chinese domestic demand has the potential to become an increasingly important source of export-led growth for China’s major trading partners – provided, of course, that other countries are granted free and open access to rapidly expanding Chinese markets. A successful Chinese rebalancing scenario has the potential to jump-start global demand with a new and important source of aggregate demand – a powerful antidote to an otherwise sluggish world. That possibility should not be ignored, as political pressures bear down on the global trade debate. All in all, despite all the focus on the US, Europe, or Japan, China continues to hold the trump card in today’s weakened global economy. While a Chinese hard landing would be disastrous, a successful rebalancing would be an unqualified boon. That could well make the prognosis for China the decisive factor for the global economic outlook. While the latest monthly indicators show China’s economy stabilizing at around the 6.7% growth rate recorded in the first half of 2016, there can be no mistaking the headwinds looming in the second half of the year. In particular, the possibility of a further downshift in private-sector fixed-asset investment could exacerbate ongoing pressures associated with deleveraging, persistently weak external demand, and a faltering property cycle. But, unlike the major economies of the advanced world, where policy space is severely constrained, Chinese authorities have ample scope for accommodative moves that could shore up economic activity. And, unlike the major economies of the developed world, which constantly struggle with a tradeoff between short-term cyclical pressures and longer-term structural reforms, China is perfectly capable of addressing both sets of challenges simultaneously. To the extent that the Chinese leadership is able to maintain such a multi-dimensional policy and reform focus, a weak and still vulnerable global economy can only benefit. The world needs a successful China more than ever.